After months of ongoing discussions, Private Media, publisher of Crikey, is officially joining the Australian Press Council. Several weeks ago Crikey, and our publisher Private Media, promised our own internal code of conduct. Here it is. 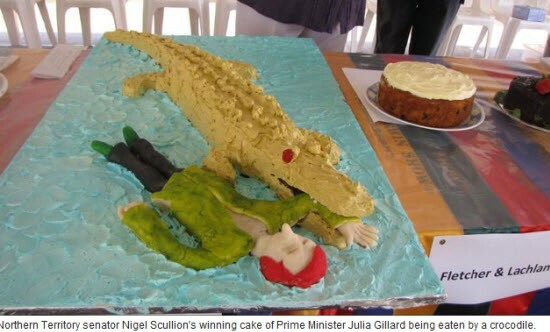 We salute these valid contributions to dumbing down and deliberately misleading the public and commend them to the public -- with extra points to Scullion for simultaneously making politics more stupid and slightly threatening with the wave of a piping bag. Sideshow Alley: I'm sorry, could you repeat the question? Each week we'll nominate the latest offerings to the service of dumbing down politics by journalists and/or politicians and at the end of each month we'll be asking Lindsay Tanner to write through his pick of the best/worst example. In a strong line-up, El Guincho seemed to be the first band to be given The Boot. A tradition that first sprung up at sister festival Golden Plains, there's no higher honour than witnessing a section of the crowd hold their shoes aloft in a sign of respect for a great performance. 20 years later, and the annual Meredith Music festival is world renowned as one of, if not the, best music festivals in Australia. What's its secret? Why does it engender such loyalty and love from patrons? Former Assange lawyer asks: what about the exculpatory evidence? James D. Catlin, who acted for WikiLeaks' Julian Assange in London back in October, told Crikey that Swedish authorities still haven't provided "powerful exculpatory evidence" -- a series of SMS messages and tweets sent by the women involved -- necessary to obtain an arrest warrant. Joye: we have an information exchange for equities -- why not debt?